Today we had to run a few errands, the ones we put off yesterday. I knew we should have finished them yesterday as it rained today. I guess we got what we deserved! After the errands, I spent much of the afternoon in the kitchen making a huge culinary mess. 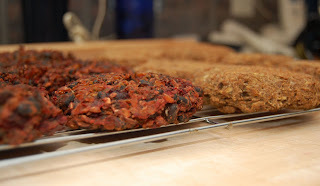 I baked Ciabatta bread, made some Eggplant Patties (with a few tweaks), and tried a new recipe for Black Bean Beet Burgers. This recipe is apparently based on some apparently amazing veggie burgers found at Northstar Cafe in Columbus, Ohio. I had originally read about them from The Healthy Hostess who also tried out the recipe recently. I actually made quite a few adjustments to the recipe. 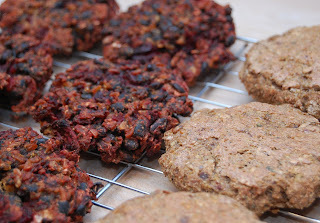 For the original, please visit The Healthy Hostess or The Kitchen "Best-Ever Veggie Burgers." In medium sauce pan, combine rice and water, bring to boil. Turn heat down, cover with lid, and simmer approximately 35-45 minutes until rice is cooked and water is absorbed. In medium sauce pan, saute onions in olive oil until translucent and softened. Stir in the beets and cook until tender. Add the garlic and cook until it is fragrant, about 30 seconds. Place beans in large bowl and lightly mash with fork or potato masher. Stir in the cooked rice, the beet and onion mixture, the lemon juice, the olive oil, and all the spices. Stir to combine and then taste for seasonings. Add salt and pepper to taste. Add the flour and stir until you see no more dry flour. Prepare a baking sheet with non-stick spray or silpat sheet. Form patties and place on sheet. Bake at 375 degrees for 60 minutes flipping once. I'll have to post about the flavors of these later. I was simply making them for a future, fast dinner option. I'm sure I'll be using them this week. I really wanted to try a new recipe tonight that I have been thinking ever since my blogger buddy Alicia at Vegan Epicurean set up a new Healthy Food Challenge. This one is for Fast Foods. The recipe is based on my Whole-Wheat Rotini with Creamy Lemon Sauce recipe. I decided to use zucchini as a pasta replacement. It worked really well actually. I was honestly impressed with how flavorful it was. You won't miss the pasta at all. 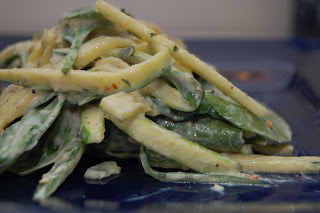 With a mandolin or spirolizer, thinly cut zucchini into strips that resemble noodles. In a food processor, blend tofu, lemon juice, balsamic vinegar, 1/2 of the lemon zest, lemon pepper spice, nutritional yeast flakes, salt, and pepper until smooth. In large non-stick skillet, saute onions and garlic in small amount of olive oil until soft and translucent. Add in artichoke hearts and saute until warmed. Add in the zucchini "pasta" and cook approximately 5 minutes. Stir in sauce and spinach and cook until spinach begins to wilt. Add in remaining zest, red chili flake, re-seasoning with salt, pepper, and/or lemon pepper blend if needed. If sauce is too thick, stir in small amount of rice or soy milk. This dish is rich and creamy. It is so much better than the original version that used sour cream. Even better, it's a super fast dish to prepare. Ideal for a busy week night. Oooh, I ordered a spiralizer and it's supposed to come tomorrow in the mail!! I can't wait to make this pasta dish! Anna @ Newlywed, Newly Veg let me know how you like the spiralizer. I just bought a cheapo mandolin just to see if I'll even get much use out of it. I love the sound of the burgers. Thanks so much for sharing that. Great job with the zucchini pasta replacement! It is one of my favorite tricks to use veggies as pasta. 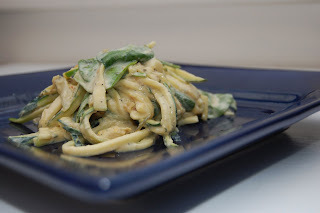 You can also use a potato peeler to make zucchini fettucini, if you want. That is what I did before I got the spiral attachment to my mandoline. Oh, that pasta! I bought a spiralizer recently and haven't used it yet. I wanted to make a zucchini noodle dish but hadn't yet come across an inspiring enough sauce. My search is over :) All I had to see was the lemon and artichokes and I was sold! Alicia @ Vegan Epicurean we may be having those burgers tonight. I'll be sure to do a follow-up on the taste. Sarah @ The Ordinary Vegetarian can't wait to see what your recipe looks like! The "pasta" dish look so good! I love the swap of zucchini instead of pasta. It looks great! Glad you got to sleep in..you need to once and a while. Kristen @ Swanky Dietitian you're right about letting yourself sleep in once in a while. I knew I needed it. Could have done it again today!!! LOL. Glad you're feeling better. Those burgers look awesome! I would have never thought to add beets but what an awesome idea!! :) Thanks! Thanks Kelly ! We'll be having them for dinner tonight actually so I'll be doing a follow-up post on taste.